Employees gifted Sonny Bonacio with his first-ever ride, a '72 Chevy pickup. Sonny Bonacio’s first truck, a 1972 Chevy pickup, was found and restored by some of his employees and given to him as a birthday present. As the country singer Kip Moore says, there’s “Somethin’ ‘Bout a Truck.” You don’t need to tell that to real estate developer Sonny Bonacio because oh, he knows. 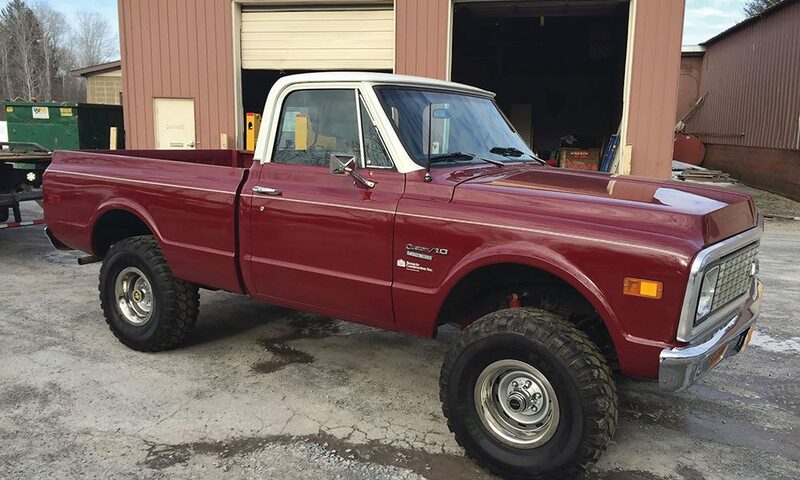 Bonacio, president of Bonacio Construction, recently felt the full force of a human-truck love affair when a group of his employees presented him with a fully restored 1972 Chevy pickup. The emotional connection? It was Bonacio’s first truck, which he bought when he was 16 with a $500 loan from his uncle. When the body rusted off the frame, and Bonacio could see the road going by under his feet, he figured it was time to get something newer. He sold the truck to a man interested in its 396 cubic-inch engine. Thirty-four years later, some of the people in Bonacio’s company found the original truck — or the remains of the truck — on Old Schuylerville Road in Saratoga Springs. Most of the original parts were beyond repair, but parts of the steering, drivetrain and rolling chassis were salvaged. They had the truck restored and gave it to Bonacio as a surprise present for his 50th birthday.